John “Hannibal” Smith used to famously say, “I love it when a plan comes together” after his squad executed one of his strategies to perfection. However, the A-Team leader never revealed the proper protocol when a scheme falls flat on its face. On Friday night, MMA mastermind Greg Jackson and partner Mike Winkeljohn conjured up a strategy for Clay Guida (Pictured) that involved an abundance of bobbing and weaving, backpedalling and some attacking. After five forgettable rounds of what UFC president Dana White referred to as “running,” their client left Atlantic City with a split decision loss to Gray Maynard, an emptied out bandwagon and a left eye that was sealed completely shut. As far as Guida was concerned, he took a ride or die approach with his coaches and the game plan they organized. 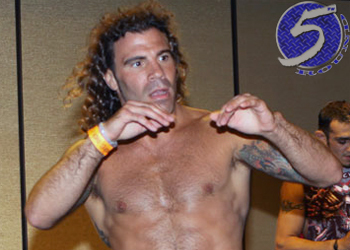 “I felt good about my performance,” Guida revealed at the post-fight press conference. “In the 3rdRound, I saw frustration on his face. That was the plan. If frustration was what Guida saw on Maynard’s face, it’s a good thing he didn’t peek over to see the disgust plastered on White’s mug. “The game plan [the fans are] used to me doing, playing Rock ‘Em Sock ‘Em Robots and get my head kicked off or punched in the face, or stick to a smart strategy and don’t be there for big punches? I like my game plan with Coach Wink and Greg, and it’s the style we came up with,” Guida flatly stated. Guida has now dropped two consecutive scraps inside the Octagon. However, it appears he may have lost a lot more than just a fight on Friday night.